Learn what it's like to be a Zookeeper! 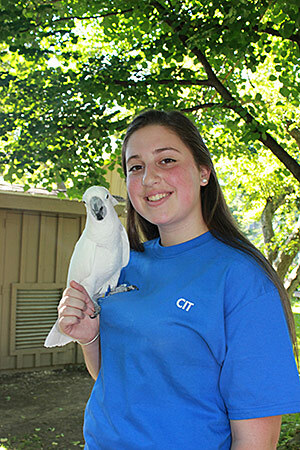 The Crew-in-Training (CIT) Program is a unique way for teens ages 14 – 17 to be a part of The Zoo Team! The program begins the last week of June and runs for 9 weeks through the summer. Crew-in-Training will gain valuable, hands-on experience of what a typical zoo keeper's day is like. We offer CIT's an opportunity to learn how our animal care program works as well as offer the chance to help in other areas of The Zoo such as Zoo Camp, special events and programs within our Education Department. *Please note that CIT’s will be eating lunch from 12 p.m. to 1 p.m. each day with Zoo Camp. Please be aware that this program works on a first-come first-served basis. All registrations will be reviewed by our Education Department and our CIT Coordinator. Please call to confirm availibltiy for program dates you are interested in. If you have any questions regarding our new registration process, please feel free to reach out to Caroline Cay Adams via email or phone at 413-733-2251, ext. 305. All paperwork must be filled out completely and submitted prior to the CIT's first session.